Image © DC Entertainment. Written by Joshua Williamson, art by Howard Porter, colors by Hi-Fi, letters by Steve Wands. 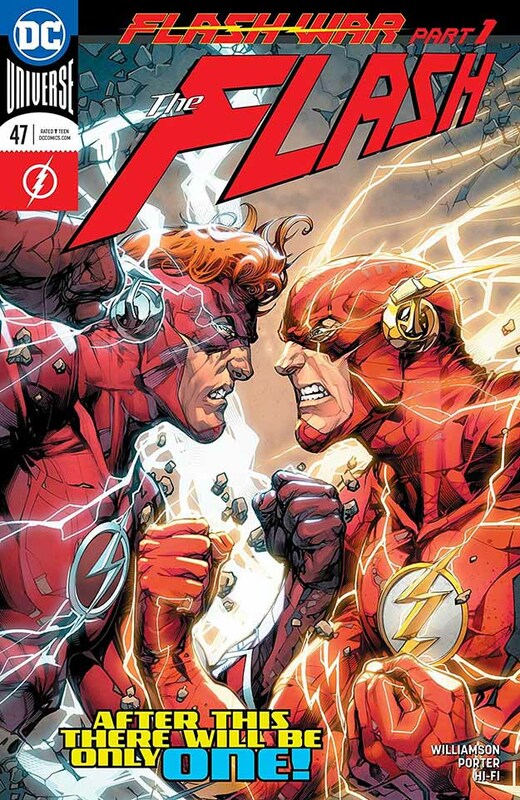 As “Flash War” begins, the war seems to be between Barry Allen and Wally West, as seen above. This is the older Wally, member of Teen Titans and not in this title’s continuity much. A younger Wally is also here, also powered, but in the care of Iris West. If you’re confused, you’re not the only one! These arguments are put aside by the arrival of The Renegades, also known as the 25th Century Reverse Flash Task Force, a group of future Rogues who have been sent to apprehend Iris West for the murder of Eobard Thawne, the original Reverse Flash (I think). One of them, Golden Guardian, is also a Yellow Lantern. Barry wants to talk, but older Wally runs off with Iris, the Task Force on their tail. Much fighting ensues, and at the end, a new menace is revealed. I find this somewhat entertaining, if confusing, and will stick with it a while longer. This title could use a character synopsis at the front end, though. This entry was posted in Comics, Reviews on July 11, 2018 by Todd.